The Companies vs. Climate Change (CvCC) 2018 event took place on Nov 28-29, 2018 at the Adrienne Arsht Center in Miami, Florida. Stakeholders representing some 100 companies and organizations convened in Miami to learn, to be inspired, to make connections, all with a common purpose: to take action on climate change. The event is widely recognized as an influential global forum for companies of all sizes to share best practices for solving climate change with wholly justifiable business value. Our mission is to serve as a conduit to bring companies together to create business-driven solutions to the climate crisis. Our focus is on three main things: the climate change crisis; how companies can address it, and the potential of collaboration to scale those solutions. While the challenges may seem overwhelming, the presenters and attendees at 2018 conference rallied their optimism and ingenuity over the two days to focus on solutions. That positive tone was set by founding sponsor TD Bank and echoed by gold sponsors EcoLab, 3Degrees, GZA, United, and Ingersoll Rand, and silver sponsor Navigant. These companies, along with many others who presented their best thinking and action on climate change, challenged attendees to think big and bold, to reinvent business models and to push for large-scale change—all empowered through collaboration. Across the two days of the conference, guided by chairpersons Kristina Joss, Head of Strategy & Commercial Director, Salterbaxter MSLGROUP, and Olivia Sprinkel, Head of Salterbaxter North America, participants heard presentations, joined roundtable discussions and formed new connections at frequent networking breaks. 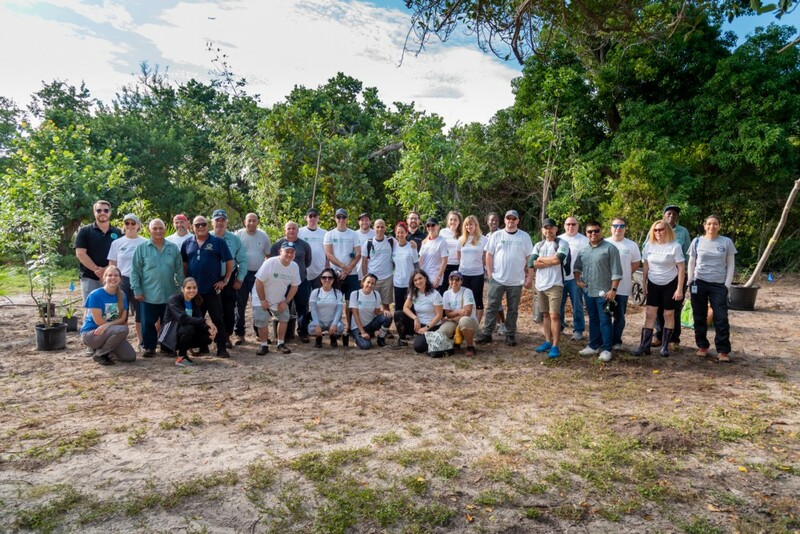 Many were part of a pre-conference volunteer day on Nov 27, planting trees at nearby Virginia Key which had been severely damaged by Hurricane Irma in 2017. We are already working on CVCC19 in both Amsterdam and Miami. We have ambitious plans for both events to deliver discussions, debates and collaborative approaches to address the role of business in climate change solutions, as our work continues. If you would like to be involved in these events, please contact me. In the weeks leading up the conference, the worsening climate crisis was frequently in the news, with scientific consensus making clear that time is running out. In early October, the UN Intergovernmental Panel on Climate Change (IPCC) Special Report warned there are only 12 years left to make massive and unprecedented changes to global energy infrastructure to limit devastating global warming. This was followed by the National Climate Assessment in November, a major scientific report issued by 13 U.S. federal agencies. The 1,656-page assessment laid out the devastating effects of climate change on the U.S. economy, health and environment, including record wildfires in California, crop failures in the Midwest and crumbling infrastructure in the South. All told, the report warned, climate change could slash up to a tenth of gross domestic product by 2100, more than double the losses of the Great Recession a decade ago. In December 2018 world leaders gathered in Katowice, Poland for a new round of global climate talks at the Conference of the Parties (COP) 24 to hammer out a key set of rules for countries to live up to the carbon reduction emissions set out in the Paris climate agreement signed by world leaders in 2015. While world leaders in Poland finally settled on a way forward, business leaders around the world, including those at CvCC 18, are already driving the transition to a low-carbon future. TD Bank has aligned its sustainability objectives with the UN Sustainable Development Goals. “We believe local action can have global impact. Last year we left this conference inspired by what so many businesses were doing and I know we will be equally inspired this year,” Foster said. “So it’s not all gloom and doom,” Joss said. She urged the attendees to use the sessions to celebrate the wins and learn from each other, to spark new ideas and collectively champion for change in 2019. Co-Chair Olivia Sprinkel introduced the five “Cs” to frame participants’ thinking during the next two days. These were: Course: to set a north star by which to navigate the choppy seas of climate change; Creativity, to be inspired by the creative solutions presented here and to take them back to their organizations, because “the creativity needed to tackle climate change is unprecedented.” Culture: to inspire an organizational culture prepared to take risks. Collaboration: to work together, as everyone has different pieces of the puzzle that together form the solution. Communications: to communicate with all stakeholders, including consumers, customers, employees, communities about the actions companies are taking to combat climate change. “So many companies are doing great things and nobody knows about it,” Sprinkel said. 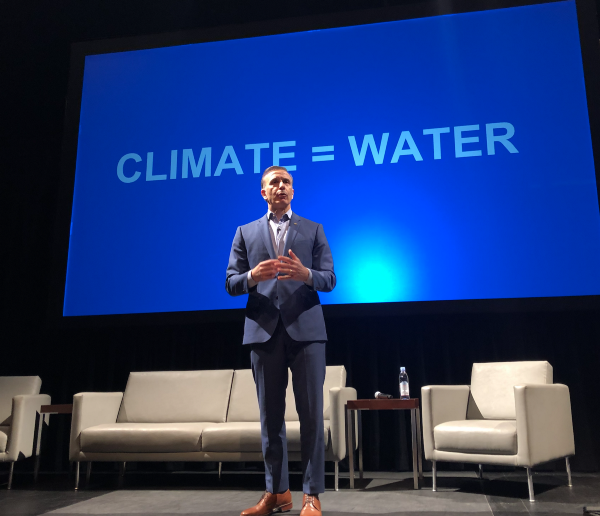 Emilio Tenuta, Vice President of Corporate Sustainability for Ecolab, a global water, hygiene and energy technologies and services firm, began the day’s presentations by underscoring how critical water is to the climate crisis. “When we talk about climate change and what to do about it, we most frequently talk about energy. But water is just as important,” he said. If left unmitigated, many of the impacts climate change will be felt in water, from rising seas, receding glaciers and erratic precipitation patterns to salt-water infiltration in farm lands, drop-offs in water quality and rising water costs for industry. All sectors of the economy can identify their water risks and take practical, money-saving steps to reduce their water and energy use along with their greenhouse gas emissions, he advised. Taken to scale, these strategies and technologies will help companies hit ambitious climate targets and cut operating costs in a water- constrained world, according to Tenuta. Sustainability is key to the organization, she said, and an external advisory board had been valuable in “challenging us to move forward and continue to raise the bar.” The company’s approach to climate innovation has been “to reshape our approach to product design and use, and to do something that wasn’t incremental, we had to develop the tools.” That became Design for Sustainability (DfS), a Product Sustainability Checklist, a Natural Resource Consumption Checklist, an LCA Decision Tool. 50% reduction in the GHG refrigerant footprint of our products by 2020 and incorporating alternatives with lower GHG across the companies’ product portfolio by 2030. $500M investment in product-related research and development by 2020 to fund the long-term reduction of GHG emissions. “It was a very meaningful commitment and we weren’t sure how we were going to do it,” she said, but added that the efforts to bring the organization on board made a huge difference. By the end of 2017, the company had reduced product emissions by 17% and met its operations goal two years early. The key lessons learned, she said: make a public commitment, start at the top, leverage the employee base, and link the business case. The opportunity to turn the site around a manufacturing facility into a meadow to build coastal resilience immediately appealed to Firmenich, the largest privately owned company in the fragrance and flavor business, founded in Geneva, Switzerland in 1895. The company’s sustainability strategy focused on 3 Gs: amplifying governance, accelerating growth, and fast-tracking green. Some 10% of its turnover goes into R&D. Ron Kurtz, Director of HSS&E, North America, for Firmenich was joined by Joseph Galley, principal of GZA, a geotechnical, environmental, water, ecological and construction management services firm, and Blaine Rothauser Senior Natural Resource Specialist at GZA, to talk about the challenge of transforming the four-acre Firmenich site in New Jersey into an eco-engineered meadow. Situated alongside Newark Bay, one of the most degraded ecosystems in the world, Rothauser explained, GZA went to work reclaiming the site over the next three years. On community day, employees helped plant 1500 shrubs, replacing harmful species with native species. They planed tidally influenced plants, built retention ponds and floating wetlands and a gazebo for bird watching. “Now our employees have a place to go out and interact with the environment,” Kurtz said. The success of the project has been recognized through growing partnerships with the US Fish and Wildlife Service, Conserve Wildlife of New Jersey, the New Jersey Corporate Wetland Restoration Partnership, and the City of Newark. The Firmenich model is an example of innovation, transformation and adaptation to climate change. A panel discussion moderated by Suzanne Shelton, CEO, of the Shelton Group brought together the Kohler Company, a globally diversified operation, and business partners to discuss the company’s experiences with renewable energy, manufacturing improvements and overall sustainability management. Shelton said the challenge is “how do we shift perceptions, build brands and make products” that contribute to solving the climate crisis. She said that Americans expect all companies, regardless of the sector, to pursue two environmental objectives: zero waste to landfill, and renewable energy. On that front, Kohler, a 145-year-old company, has been active for many years, according to Nathan Nissen, Principal Engineer for Sustainability at Kohler. Kohler has a long-term vision of Net Zero 2035. Recently Kohler Co. signed a Purchase Agreement (PPA) that will provide enough renewable electricity to power all company operations in the US and Canada This project is expected to lower Kohler’s global GHG footprint by 26%. Besides this investment, the company drives energy efficiency improvement in manufacturing processes, buildings, and truck fleet. They are installing onsite renewable energy projects around the world. In addition, Kohler is implementing new manufacturing technologies, and developing new products and materials that require less energy to produce. Kingspan Insulated Panels has joined over 370 companies across the world in a commitment to the Science Based Targets Initiative to reduce GHG emissions worldwide. Brent Trenga, Building Technology Director at Kingspan Insulated Panels, spoke about how Kingspan has committed to become a Net Zero Energy (NZE) company by 2020, a commitment that applies to each of its 121 facilities worldwide. The company’s aggregate renewable energy use is currently 78 percent, putting Kingspan firmly on track to achieve its Net Zero Energy goal by 2020. The company’s five North American facilities are currently 70.8 percent. His goal, he said, is for Kingspan to get to carbon positive. NZE 2020, he said, “really changed the direction of the company.” There are three guiding principles for NZE: save more energy (with energy efficiency measures in areas such as lighting and heating); generate more renewable energy (Kingspan’s on-site renewable energy generation jumped from 6.6 GWh in 2012 to 32.2 GWh in 2016) and buy more renewable energy (in 2016, all electricity used at North American manufacturing sites was procured from certified renewable sources). Climate change has many potential impacts on aviation, Aaron Stash, Manager, Environmental Strategy and Sustainability at United Airlines, told attendees. This includes higher fuel costs, warmer temperatures that increase fuel use during takeoff, impacts at airports like sea level rise, increase in weather intensity and unexpected weather impacts and demand changes, like customers choosing to fly less with those airlines that are more GHG-intensive. While aviation is a catalyst of social and economic progress, Stash acknowledged the sector produces 2 percent of CO2 emissions. “We support a global approach to addressing greenhouse gas emissions in the airline industry,” Stash said, noting that United works with other airlines, engine and airframe manufacturers, fuel suppliers, airports and governments toward collective industry goals. These include a 1.5 percent average annual fuel efficiency improvement through 2020 and carbon-neutral growth beginning in 2020. To get there, United invests over $2 billion in improving fuel efficiency every year. The measures United has taken, including retiring the Boeing 747 from its fleet in favor of newer, more fuel-efficient aircraft, has helped it improve fuel efficiency by 45 percent since 1990. However, the figure Stash kept repeating shows the significance of the challenge: United uses 4 billion gallons of jet fuel annually, almost 99 percent of its carbon footprint. A big part of the answer to lowering this, he said, is sustainable aviation biofuels. United started using biofuels continuously in 2016 and in 2018 marked a milestone of over 2 million gallons flown using biofuels, including the longest dedicated transatlantic biofuel flight. “We are one of few airlines in the world using biofuels on a commercial basis,” Stash said. “The supply of biofuels doesn’t exist at level we need it today, but we are helping to create the supply, to bring it to market.” That includes World Energy – supplying Los Angeles (LAX) International Airport and Fulcrum BioEnergy, what Stash called “our Back to the Future project, inspired by the film. A biorefinery based near Reno, Nevada, it will open in early 2020 as the nation’s first commercial-scale plant to convert landfill waste into renewable fuel. In introducing TD Bank’s Ready Commitment, aimed at working together for a more inclusive future, Joe Doolan, Head of Environmental Affairs at TD Bank, began with his personal connection to climate change and sustainability. “I’m a father first and I try to role model good behavior. I feel good about bringing about something good in the communities we serve and for the colleagues we work alongside with,” Doolan said. In The Ready Commitment, TD is investing $1 billion CAD by 2030 in four areas that support change, nurture progress and contribute to making the world a better, more inclusive place: Financial Security, Vibrant Planet, Connected Communities, and Better Health. Part of that commitment is supporting the transition to a low carbon economy – with a CAD $100 billion target in low-carbon lending, financing, asset management and other programs by 2030. TD was the first bank in North America to become carbon neutral in 2010. Work with companies, ventures and projects that are driving innovation and contributing to carbon emissions reduction, energy-efficient housing and urban green space enhancement. Accelerate the low-carbon economy – including renewable and clean energy technologies, businesses and processes – through TD’s low-carbon lending, financing, asset management (in accordance with TD Asset Management’s sustainable investing approach) and other programs. Foster understanding and dialogue – through research, publishing and conversations – to help society and the economy make a successful transition. Enhance focus on successful green bonds strategy, (issuing, underwriting and investing) to support projects that provide both economic growth and environmental benefit. Build on a 7-year track record of carbon neutrality to further reduce TD’s carbon footprint. The first day of the conference concluded with a number of roundtable discussions which provided a smaller, more hands-on problem-solving setting for conversation and debate. Carbon pricing: Can we find a path forward? Brendon Steele, director of Stakeholder Engagement for Future 500, which helps companies and their stakeholders apply complementary strengths to common sustainability goals, led a discussion of Carbon Pricing: Can we Find a Path forward? The group noted how carbon pricing in the US is finding new corporate allies, and not the ones you might expect: from oil super majors like ExxonMobil and Royal Dutch to corporate sustainability icons like Unilever and Johnson & Johnson—with a sprinkling of Reagan Administration veterans in the mix—backing a ‘revenue-neutral’ approach put forward by the Climate Leadership Council. However, just as corporate support for carbon pricing proposals has gained steam, the environmental community is now asking new questions of climate policy. As climate campaigns center on justice and equity concerns, they’re asking if policy proposals are fair, address unequal burdens, and if they foster a ‘just transition’ to clean jobs for disenfranchised communities. The group grappled with these questions: Is there room for common ground? How should business grapple with these issues? And do most companies even understand the basics of carbon pricing and how it can benefit their business and the economy, let alone understand the nuance that drives debate? The need for dialogue and engagement between environmental justice advocates and business leaders is now ever more acute, in order to find a path forward on carbon pricing in the US. Yoca Arditi-Rocha, Executive Director of The CLEO Institute, a non-profit, non-partisan organization dedicated to climate change education,engagement, and advocacy, led a conversation about Preparing Current and Future leaders: Why Climate Education Matters. Roundtable participants discussed how to build sustainability buy-in and core principles and values from the top-down and the bottom-up. They explored how “sustainability projects’ in many cases are seen as the responsibility of the sustainability department whereas sustainability should be engrained in every single aspect of the business’ culture. More importantly, the roundtable focused on how to prepare the current and future workforce in the face of a warming world using education and capacity building to increase the level of climate literacy in a holistic manner. If companies are always looking to invest in the latest technologies demanding from their employees to be trained on the latest software, program, our model they think may give them a cutting edge, why aren’t companies instituting/offering educational opportunities for current and future leaders on how to tackle the biggest existential crisis we face? Is climate change/sustainability education a must in the Anthropocene era? The CLEO Institute thinks it is and urges companies and individuals in Florida to sign up for a CLEO Climate 101 Lunch -n-Learn today! Rosalinda Sanquiche, Managing Director, North America, the Centre for Sustainability & Excellence (CSE), specializing in helping companies, organizations and individuals excel in their sustainability knowledge and impact, got a group of attendees engaged in a discussion about How Sustainability Reporting Commitments Engage Employees And Other Stakeholders On Climate Change. This roundtable focused on the importance of the materiality assessment to inform sustainability reporting. There was some question as to whether such an effort is worthwhile, with a number of differing opinions. The general consensus was that the value of a report is primarily in meeting stakeholder expectations – reporting on the topics most material to key decision makers who can impact a company or organization. This is supported by CSE’s ongoing research. The next important value is as a form of outreach. Making the report comprehensible to a wider audience increases the brand’s transparency and community engagement. The report becomes a tool which can be used as press releases, thought pieces, mini-reports, articles, etc. Participants presented the many ways in which sustainability reporting has presented value to their organizations. Richard Watt, Managing Director, Global Portfolio Management, Epoch Investment Partners sparked an engaged discussion around the topic of sustainability and ESG, answering the questions: What is the purpose of incorporating ESG considerations into investing practices? What are the practical implications for companies in terms of policies, resource allocation, and processes to demonstrate ESG is meaningful? Much of the discussion was about the disconnect between the information that investors want and need and the information companies are actually providing: more dialogue is needed. Paola de Angeli, Managing Partner at The Sustainability Blueprint, which helps companies and organizations develop and implement a fundamental strategic action plan to integrate sustainable practices into their operations, led a group in a Discussion of SDG 13 – Climate Action. Discussions focused on resiliency as related to one of the indicators under this SDG, and companies’ advocacy efforts. This would involve engaging with local government officials all the way through the federal level as regards policy that can impact an organizations’ ability to re-establish daily operations after a climate related event takes place. Additionally, the group brainstormed ways that individuals and citizens can become aware of the SDGs in general. Barry Stamos, Co-Founder of 1heart, which is aimed at fostering a new generation of heart-led leaders birthing conscious companies, using business as a force of good to transform lives and the planet, led a group exploring Conscious Capitalism: Elevating Humanity Through Business. He was joined by Spencer Jacobson, Co-Founder and CEO of Guided, a company with the mission of democratizing access to great coaching and helping people and organizations unleash talent. VPPA Readiness: Is Now the Time? The second day of the conference launched with a lively panel discussion on an approach to meeting renewable energy commitments quickly gaining traction: Virtual Power Purchasing Agreements (VPPAs). The discussion was moderated by Kristina Joss of Salterbaxter MSLGROUP and led by Scott Martin, Vice President, Business Partnerships, Renewable Energy and Climate, and Dan Kosciak, Senior Business Manager, Renewable Energy and Climate, both of 3Degrees. 3Degrees is a N.A. specialist in renewable energy and climate solutions, helping organizations incorporate clean energy and GHG reduction strategies into their business operations and works with 15 utilities across 18 states, assisting companies to take urgent action on climate change. There are a host of renewable energy options available to companies looking to reduce their GHG emissions – from unbundled Renewable Energy Certificates (RECs), to VPPAs and Power Purchasing Agreements (PPAs), and even renewable energy aggregation. According to Martin and Kosciak, choosing a solution requires companies to reflect on their own sustainability journey in order to determine the strategy that will best fit their goals. For some, VPPAs might represent the right solution. Unlike a physical PPA, a virtual PPA is a financial contract rather than a contract for power. The offtaker does not receive or take legal title to the electricity and in this way, it is a “virtual” PPA. In a VPPA, an offtaker agrees to purchase a project’s output and associated RECs at a set fixed price. The developer then liquidates the energy at market pricing, calculates the final settlement rates, and then invoices the offtaker for a debit of credit. An important factor for company’s readiness is to ensure that it does enough education internally to “bring your stakeholders along. That is often where VPPAs fall apart, if a company didn’t have all the right parties at the table and didn’t bring their organization with them. So stakeholder engagement is a very important part of this. Taking this on can be very challenging for companies,” Martin said. The rewards can be significant, however, as Kosciak noted in his presentation of a case study in which four firms, Akami, Apple, Etsy, and Swiss Re, partnered on a 290MW VPPA, , the largest renewable aggregation to date. By joining together, he said, smaller energy users can create enough buying power to make a material impact on a project’s financial outlook, he explained, attracting the attention of project developers and opening this impactful solution to a wider range of companies. In addition, by bringing multiple companies into a single procurement, aggregation has the ability to reduce transaction costs and create economies of scale. This aggregation resulted in six power purchase agreements – the largest one greater than 130 MW and the smallest less than 5 MW. The companies’ efforts demonstrate how corporate energy buyers of all sizes can successfully purchase renewable energy directly from new renewable projects. Elizabeth Heider, Chief Sustainability Officer for Skanska, is a firm believer in the possibility of getting to zero carbon in the building industry. Skanska, one of the world’s leading project development and construction groups, is on a Journey to Deep Green™, creating buildings and civil infrastructure that have near-zero environmental impacts and reduced long-term operating costs. A key part of the company’s sustainability strategy is reducing the Group’s carbon emissions footprint, in line with the Paris international climate agreement. As Heider told attendees, buildings are responsible for 30 to 40 percent of GHG emissions. And these emissions are set to rise, she noted, with two trillion square feet of new and rebuilt buildings to be constructed in cities worldwide over the next 35 years—that’s an entire New York City every 35 days for 35 years. “If we don’t address the carbon in what and how we build now, it may not matter how efficiently we operate our buildings over time. Irreversible damage will have been done,” Heider said. Embodied carbon is the total emissions related to construction materials and construction activities, and operational carbon denotes the emissions associated with the heating, cooling and electrical consumption of a building during its operational lifespan. Under the leadership of Stacy Smedley, Skanska is currently co-developing an embodied carbon calculator for construction (EC3) that will be an open source, free tool to allow everyone in the building industry to understand, benchmark and reduce the carbon emissions associated with their building’s materials. “Together with the Carbon Leadership Forum and other industry leaders we have collected the carbon footprint for over 1,000 buildings to create an open source database, Heider said, in the hope of raising industry-wide awareness and galvanizing action towards reducing building emissions. Arnaud Brohe, CEO of CO2logic, which helps organizations tackle their environmental challenges, wasted no time in setting the tone for the next event, a panel discussion taking a closer look at Carbon Accounting 2.0—how carbon accounting has moved from a “nice to have” in CSR reporting to a “must have” to remain competitive. Steelcase found it helpful to use Environmental Product Declarations developed from LCAs to determine a more appropriate approximate emission factor multiplied by revenue to calculate purchased goods and services. Gale Tedhams, Director of Sustainability at Owens Corning, which develops, manufactures, and markets insulation, roofing, and fiberglass composites, also on the panel, said her company was working on science-based targets, and that their goal is to reduce GHG emissions intensity by 50 percent from 2010 baseline and to become a net-positive company. “We have set this goal and in concert with that we want to create a market pull for climate action, and for UN SDG 13,” Tedhams said, adding that Owens Corning had aligned its strategy with helping to achieve the SDGs. Part of that journey has been Owen Cornings’ investment in renewable energy. The company now annually purchases around 1.1 million megawatt hours of renewable energy, and is now applying the RECs from these purchases to reduce carbon in our products. Increasingly, the investment world is looking for companies to match that kind of vision with rigorous environmental, social and governance (ESG) disclosures. Chris Hagler, Executive Director, Climate Change and Sustainability Services for EY, helped attendees understand the guidance being provided by the Task Force on Climate-related Financial Disclosures (TCFD) to better understand and monetizing the risks related to climate change. Executing against that guidance isn’t always easy, she added, offering practical ideas on identifying, prioritizing and monetizing a company’s climate impacts. The TCFD has developed guidelines for voluntary, consistent climate-related financial risk disclosures for use by companies in providing information to investors, lenders, insurers, and other stakeholders. The aim is to help companies understand what financial markets want from disclosure in order to measure and respond to climate change risks and encourage firms to align their disclosures with investors’ needs. To date, some 513 companies have adopted, or intend to adopt, the guidelines. “What we learned in the first year of the Task Force’s work is that majority of companies were disclosing information but almost none of them were disclosing the financial impacts,” Hagler said. Often, she said, there is a disconnect, with sustainability reports describing climate risks but that these are not mentioned in a 10K report. A recently released Climate Risk Disclosure Barometer 2018 produced by EY showed the quality of disclosures across all sectors was low, with the average quality score at 25 percent. Banking and energy sectors were the highest-scoring sectors (49 percent and 35 percent respectively), indicating that shareholder pressure is a key driver. In the next session, Jan Vrins, Managing Director, Global Energy Practice Lead for Navigant, led a session showcasing how three companies—Alaska Air, McCormick, and Royal Caribbean— attack emissions by land, sea, and air. For instance, Royal Caribbean is working hard to decarbonize its emissions while at sea, McCormick is reducing its emissions close to land where it sources ingredients, and Alaska Air is taking a leadership position by decarbonizing its emissions in the skies. Anshul Tuteja, Director, Energy Management at Royal Caribbean Cruises, said the company’s aim is to reduce its emissions by 35 percent by 2020, part of a five-year partnership with the World Wildlife Fund. According to Tuteja, they are making steady progress on emissions reduction, sustainable sourcing, and destinations stewardship, including designing its next class of ships to be powered by LNG and fuel cells. In 2017, Royal Caribbean joined We Are Still In, a coalition of companies, cities, states and universities who reaffirmed their commitment to uphold the 2016 Paris Agreement. McCormick, the largest spice company in the world, has identified climate action as key to its journey. By 2025, its goal is to cut GHG emissions by 20 percent; packaging by 25 percent, water usage by 20 percent, solid waste by 80 percent and plastic packaging by 100 percent. Vrins concluded the panel by asserting that more and more cost-attractive technologies are available to help companies to achieve their energy and greenhouse gas emissions goals. Ultimately, leveraging these technologies and the accompanying positive business case is leading to energy and climate strategies heavily supported by both CEOs and investors. This translates to more company initiatives that address emissions across the value chain. Electricity and fuel providers are contributing to this cause by developing cost effective clean and renewable energy solutions. When emissions are embedded in the way companies source supplies—reducing the embedded cost of carbon—companies see cost reductions and climate solutions at the same time. When Hugh Welsh, President of DSM NA, a global purpose-led, science-based company specializing in Nutrition, Health & Sustainable Living, bounded onto the stage, he was clearly excited about the opportunity to redefine a company’s vision through the prism of sustainability. DSM, he said, had lived this story of transformation. Originally, the Dutch State Mining Company, it shifted decisively away from being a coal mining and chemical company (recognizing, Welsh said, that “those businesses today don’t have a bright future tomorrow”) and entered new businesses where it had solutions to offer. Today DSM is the biggest nutrition company in the world, in products ranging from vitamins to animal feed and is also a very large clean energy company (with the largest solar field in the US opening in January) and biotech company. “We make ethanol not from corn but from the waste product left on the field,” he noted. DSM has set its own internal price on carbon, at 50 euros a ton. DSM has even created a fully recyclable carpet. From Welsh’s perspective, sustainability is not just a challenge that needs to be mitigated in a company’s operations, but also represents a tremendous business opportunity to drive growth and enable customers to address an uncertain future. Business, he said, has an obligation to advocate for policy change to create a sustainable future for all. Astra Zeneca: To make change, be the change! Mike Dietrich, Energy and Sustainability Manager at MedImmune/Astra Zeneca, a global, science-led biopharmaceutical business, explained how AstraZeneca uses its ground-breaking science to bring health to society while protecting the health of the planet. This session reviewed strides made in energy, water, and waste reduction with goals of zero energy and zero waste on the horizon. “At AstraZeneca we use our ground-breaking science to bring health to society while protecting the health of the planet. We support global progress on megatrends such as the United Nation’s Sustainable Development Goals (SDGs),” according to Dietrich. Over 300 million tons of plastic are produced every year, and half of that is for single use. Only 14 percent of global plastic packaging is recycled; the rest is lost after single use: with an estimated lost value of $80 to $120 billion. Nearly one-third of that plastic makes its way into our ecosystems and can linger for hundreds of years. Walgreens Boots Alliance, he said, took a look at the plastics in their products and “there was lots of it. We are looking to take the challenge of trying to design products for recyclability. Our goal is to reduce the waste we create, on a comparable basis, and contribute to the drive for increasingly circular economies through increased re-use and recycling.” Of the waste generated by the company in fiscal 2017, approximately 50 percent was recycled. A zero waste to landfill Initiative has resulted in over a90 percent diversion rate in the company’s distribution centers. The next step is to take the initiative to the corporate support center and eventually to stores. Last month, my colleague, Dan Kosiak, and I attended Companies vs. Climate Change (CvCC) in Miami, FL. Now in its second year, the conference strives to bring companies together to create business-driven solutions to the climate crisis. 3Degrees had the distinct pleasure of serving as a premiere sponsor of the event.This year, organizations of all sizes convened to discuss how to work collaboratively to address climate change. The audience was an energizing mix of people from the worlds of corporate and institutional sustainability, policy, consulting, and more, with an interesting blend of perspectives from global, local, governmental and the private sector. One of the most interesting aspects of the conference was the real-world stories and deep-dive examples that attendees from each of these unique groups brought to the table. Many of the sessions focused on how organizations are tackling climate change from different angles – each sector with its own unique challenges, focuses and potential solutions. Despite the wide range of approaches, the common thread among the organizations was their shared passion to figure out the most impactful way they could address climate change. Current trends in the renewable energy market show that the demand for voluntary VPPAs has more than doubled in recent years. 1 In fact, corporate power purchase agreements now account for about ¼ of total global renewable electricity sourced. 2In spite of this aggressive growth, it is still important to note that PPAs and VPPAs are not the only tools in the GHG reduction toolkit and are not advisable for all buyers. There are clear benefits, as well as risks and challenges when executing this type of long-term renewable energy purchase. Corporate buyers must determine their inherent risk tolerance. In the ‘pros’ column, VPPAs require no capital investment and provide a clear and positive environmental impact; however, committing to a 12-15 year investment with fluctuating market value may leave some feeling financially exposed. In an effort to provide real-world examples and practical guidance, Dan and I guided the audience through a recent VPPA Aggregation supported by 3Degrees and executed by Apple, Akamai, Etsy and Swiss Re. A deal this complex emphasized the need for established leadership, commitment to timelines and a shared idea of goals and success. Each of the participating companies demonstrated key maturity attributes and achieved certain milestones in order to be in the position to execute on the VPPA. I was inspired by the audience’s very apparent interest in VPPAs and how they can be incorporated into sustainability strategies. However, the challenges around understanding how these transactions work, their implied benefits, how to define success and why to do it is undeniably real – especially given the many available, and sometimes conflicting, sources of information on the topic. The good news is, as increasing numbers of PPAs are executed and more projects start to come online, the path will become more worn and answers to these difficult questions will become more evident. As we departed this year’s Companies vs. Climate Change, I left feeling inspired by how effectively corporations can work together, learn from each other, and guide one another toward making real impact in the fight against climate change. Thank you to the team who makes this important conference possible; we’ll be back next year! Companies are taking climate matters into their own hands. While last week President Trump stood firm in the administration’s decision to withdraw from the Paris climate agreement at the G20 meeting in Argentina, we went to Miami where representatives from both US and global companies met at the Companies vs Climate Change Conference (CVCC). The conference has two events a year, one in Europe and one in the United States. The majority of the companies present have signed the “We Are Still In” pledge which states that they will continue to support climate action to meet the Paris Agreement. There was a variety of companies present, from manufacturing to airlines and cruise lines. When it comes to revamping our economy to be more sustainable, the players are varied and the plays range from simple to complex. Thus, the conference consisted of a broad range of stakeholders within sustainability in the private sector. Managers, directors and chief officers of sustainability (CSOs) of Fortune 1000 companies were present. Present too were a variety of sustainability consultants, sustainability guidance bodies, marketers, and of course, carbon offset aggregators. Each of these groups creates an ecosystem of collaborators who may just lead the charge on redefining what it means to do business in an economy where climate can no longer be ignored as part of the equation. Consumers are demanding sustainability as part of the businesses they choose to support, and this has lead to the recent rise in the number of “director of sustainability” and CSOs hired by corporations. The CVCC conference set a forum of open communication and collaboration. It was a united front on climate change. United Airlines took the stage on Wednesday, then Alaska Airlines on Thursday. Virgin Voyages, which announced plans for a new terminal at PortMiami just hours before, was also there to hear from and connect with Royal Caribbean Cruise Line to discuss how the two companies could inform each other on sustainability leadership in the cruise industry. And this type of open, non-competitive communication between big businesses, aka big emitters, is vital. In order for the private sector to make significant headway on climate change, it needs to functions as an ecosystem of collaborators. “We believe that when it comes to energy and environment, there is no competition,” said Royal Caribbean’s Director of Energy Management Anshul Tuteja. During a time when the rift between values of nationalism and globalism have torn apart friends, families, and nations, and when the existential crisis of climate change is such a divisive issue politically and a consensus on climate action seems nearly impossible, leadership that inspires the combining of forces is needed more than ever. And based on what we saw at CVCC, it might just be that the leadership we’re looking for lies within the hands of the private sector, and in our hands as consumers to demand environmental excellence from these companies. Jason Youner founded Companies VS Climate Change with support from TD Bank, in order to bring together companies to communicate and catalyze continued climate progress. The conference brought together an impressive group of sustainability leaders who were not only the right people to bring to the stage because of their titles and roles but also because of their quality public speaking skills. There were no monotone speakers. No one using the stage to boost their own ego. Speakers were there to have a conversation with the audience and to share what they’ve learned on the journey of improving the sustainability and integrating climate solutions into their businesses. Below are some of our key takeaways from the conference. What we’re seeing right now is new. Companies are voluntarily signing up to meet sustainability targets and are not waiting for politicians to tell them to. And each company has to discover its own path forward. Thus, the first step is for companies to set sustainability targets. Next, companies need to have a plan for measuring progress and meeting their target on time. Measuring and monitoring is key to informing strategy of where a business should focus efforts in order to meet its sustainability goals. Companies are therefore conducting what are called materiality assessments in order to determine what should be reported and where opportunities lie. Because every organization is different, these assessments are, again, not one size fits all. Hence, the large number of sustainability consultants present at the conference. These third parties play a key role in helping businesses keep track of progress and meeting their end goals. Most, if not all, of these businesses, have set sustainability goals. Most take the form of emissions reductions. For example, Ingersoll Rand, an industrial company that produces HVAC systems, have set goals for emissions reductions in both their operations (35% reduction by 2020) as well as the lifespan of the product-use (50% reduction by 2020). Ingersoll Rand is a great example of companies taking things a step further. They set sustainability goals not just for their operations, but also for the product-use, which is 20 times greater than their operations and production. The lazy days of greenwashing are coming to an end as we see large companies such as this taking it upon themselves to restructure and redesign their product offerings and providing measurable proof of their decreased footprint. Goals for emissions reductions are some of the lowest hanging fruit when it comes to giving your company a sustainability make-over, because you can take direct action to address emissions reductions by using less energy, purchasing renewable energy, increasing the energy efficiency of operations and offices, etc. These type of reductions in scope 1 and 2 emissions can typically yield to greater cost savings, i.e. use less fuel, pay for less fuel; use less electricity, pay for less electricity. And there’s more to the cost savings equation than just energy. Reducing energy can also directly lead to water savings, which also leads to reduced costs. Water is highly localized, and how companies should address water conservation is not one size fits all. Enrique Tenuta of EcoLab announced the new Water Risk Monetizer that businesses can use in order to better understand the tangible and intangible value of water. Business is business. There has to be a business value to anything a company does. Whereas before companies were making decisions based on profitability, now with the awareness of social and environmental values on corporate success, the concept of a triple bottom line is incorporated more and more in business planning. It is up to sustainability managers to work either independently or with the help of consultants to discover and clearly define where conventional economic opportunities and sustainability initiatives overlap. President of DSM, Hugh Welsh, addressed the room full of directors of sustainability and stated that they must put forward strategies with clearly defined benefits business. Those who can find these opportunities and harness the value of sustainability to grow the value of companies are those who will lead the next generation of business leaders. “Climate change is going to become a proxy war on capitalism… I really believe that the future CEOs are going to come out of the sustainability groups.” — Hugh Welsh. One of the speakers (who requested not to be quoted on this) was asked “What’s next?” and responded that the only way to make significant action on climate change is to address carbon removal and that they would soon push their company to consider how it can be “carbon positive”. Carbon positive means that the company would be responsible for drawing down more carbon than it is emitting. The fact that large companies are even considering a future of paying down their carbon debt is exactly why Nori is doing what we’re doing. We want to enable these businesses to reach not just their carbon neutral goals, but future goals of carbon positivity. A long-term solution to climate change must include scaling up carbon removal to be greater than the total carbon emitted in the atmosphere. Disclaimer: as an engineer by study, I personally cringe at this term. Carbon “positive” was created as an alternative to the idea of “carbon negative” which people have said has a “negative” connotation. I, on the other hand, think “carbon positive” is silly and makes no mathematical sense and just gets under my skin.